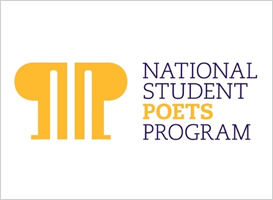 Editor’s Note: The 2016 class of five National Student Poets was selected from a national pool of more than 20,000 poetry submissions. Throughout the year, each poet will serve as a literary ambassador and will share their passion for poetry and the literary arts with their communities through service projects, workshops, and public readings. In addition, each poet will receive an academic award of $5,000 funded by the Bernstein Family Foundation and will serve as a resource to the U.S. Department of Education and the Library of Congress. This blog features the poet representing the Northeast region, Joey Reisberg. On a muggy midsummer Baltimore day, I wandered into the air-conditioned sanctum of the Baltimore Museum of Art, notebook and pen in hand. I was here on a secret poetry mission, having just received a phone call informing me that I would be representing the Northeast as a 2016 National Student Poet. The program is a collaboration between the Institute of Museum and Library Services, the President’s Committee on the Arts and the Humanities, and the Alliance for Young Artists and Writers. I was overjoyed to be joining the fifth class. The first NSPP assignment popped into my inbox soon after the momentous phone call: travel to the nearest museum and write a persona poem about a piece of artwork. I had dabbled with persona poems before, enjoying the opportunity to embody another speaker’s voice, and the capacity for empathy that the style allows. At first I shuffled through the older art, uncertain, my brain just bouncing back off the gilt-encrusted religious triptychs and the fantastically pompous portraits of royalty. I was faced with the opposite issue in the modern galleries—given hyper-minimalist geometric figures, my imagination delved in too deep, giving me far too wide a scope to whittle into a poem. A little panicky, (this first assignment was due in a couple of days and I was being way too picky) I stumbled almost by accident into a small gallery off the main courtyard. The Baker Artist Award exhibit was here, a local competition for Baltimore area artists. Occupying a back wall, I encountered Joyce J. Scott’s artwork for the first time. 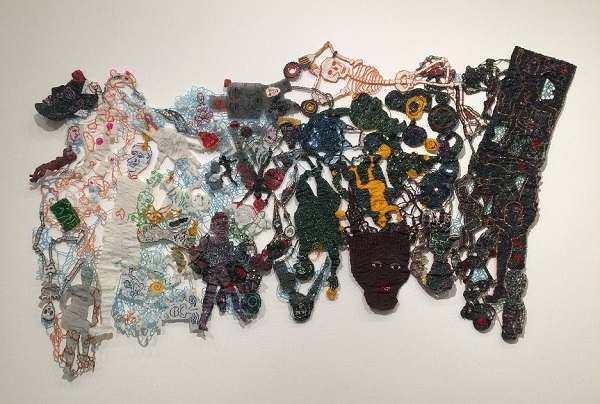 Joyce, the recent recipient of a 2016 MacArthur grant, uses beadwork, glass, and jewelry to create powerful works of art, often with ties to social injustices, race, and gender. Her “Nuanced Veil” drew my eye, with its wild energy and colors. I turned to a fresh journal page and quickly transcribed the words that were flashing in my head, quick and fiery and snappish. “Vortex.” “Teeth.” “Chaos.” “Beetle-skin.” A poem soon followed. Some months passed by. Another email appeared in the inbox. This was an invitation to a special lecture by Joyce J. Scott at the museum. I would be reading the persona poem. People say there is no uncertainty about meeting Joyce J. Scott. When you’ve met her, you won’t ever forget her. This is absolutely the truth. She has a quick wit, especially when describing the origins for her artwork or when barking orders at the slide show operator to get to the next one. Looking at her immense body of work flashing by on the screen, I was struck by the parallels between beadwork and poetry. We both use small units (beads and words) strung together in beautiful, sometimes shocking patterns. Both art forms have a spark of something elemental: earth and glass to make beads, breath to make words and language. And we take what’s scattered and disparate and make something cohesive. This is art’s power, poetry’s power. To gather the fragments and bits and make something recognizable again. knocking together as teeth / as wind through spiderweb, breath fluttering between woven ribcage. many roles: amniotic sac, wedding / veil, shroud. always the intricate jewels arranged into paper cut-outs. (our favorite task glueing / eyelids shut, projecting dreams against the plushy bloody velvet.) envoys from chaos, where being incomprehensible / is means of camouflage. broken at birth, we always find / ourselves stitched together again at land’s end. luminous membrane around a tiny pearl. Joey Reisberg currently serves as the 2016 National Student Poet for the Northeast region. He is a junior at the George Washington Carver Center for Arts and Technology, studying Literary Arts. Catch his poems appearing or forthcoming in Red Queen, Sugar Rascals, Moledro, Fissure, and the Scholastic Art and Writing website.